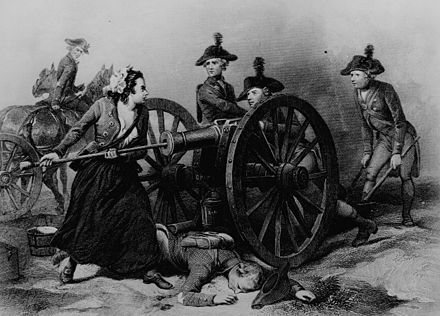 During the American Revolution thousands of women took an active role in both the American and British armies. Most were the wives or daughters of officers or soldiers and it was these women who maintained an almost constant presence in military camps, and were called “Camp Followers.” Camp Followers were also people who have served with the army, but who were not “listed” included: waggoners, sutlers, servants, children, craftsmen, and gentlemen volunteers. Their presence enriched camp life and greatly enhanced the labor force necessary to support an army in the field. Specific duties may be primarily of cooking, mending, laundry, childcare, and nursing the sick to which these woman were paid a small wage and was supplied with a half ration of food for herself. The movie “Last of the Mohicans” visualized excellent examples of the importance of the role of a Camp Follower within the British army and the dangers they faced in Colonial America. While the above mentioned tasks were performed by the majority of women found within camp life, an occasional woman found herself placed in extraordinary circumstances. Her participation in such situations were frequently well beyond the roles dictated by the society of the time. 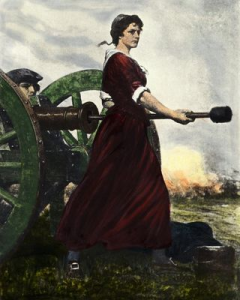 Margaret Cochran Corbin and Mary Ludwig Hays (or “Molly Pitcher”), were two camp followers whose husbands were artillerymen and they assisted by nursing the wounded and bringing water to those in need. Both women saw their husband wounded on the battlefield. As they went to their aid they found themselves participating as “combatants”; taking up their husband’s post as Matross or Gunner’s Assistant. These ladies were acknowledged for their service to their country with military rank and honors. The Camp Followers “un-organization” first appeared in Southern California in 1976. A National Sojourner, Hero of ’76, realized that if he were ever to be successful in establishing an annual Joint Area Heroes Encampment there would have to be a role in it for the ladies. He also realized that their role must be one of equal participation and not that of subservient women-folk. It was decided that a degree, which honored the ladies and the role they played in the founding of this Nation, was the solution. The Degree was to provide innocent fun and enjoyment for both spectators and participants as well as to honor the ladies for their contribution to the Nation, Freemasonry, and the National Sojourners and Heroes of ’76. To become a Camp Follower a lady must be sponsored by a Hero and must have demonstrated her support for the Heroes by attendance at an Area Encampment, Area Conference, National Convention, or such other qualifications as may be found acceptable. The degree has not been commercialized nor does it have dues, chapters, or any other form of organization. The founders never intended that it have any other purpose than to honor those ladies, who have performed outstanding service to our country and to the Heroes of ’76.